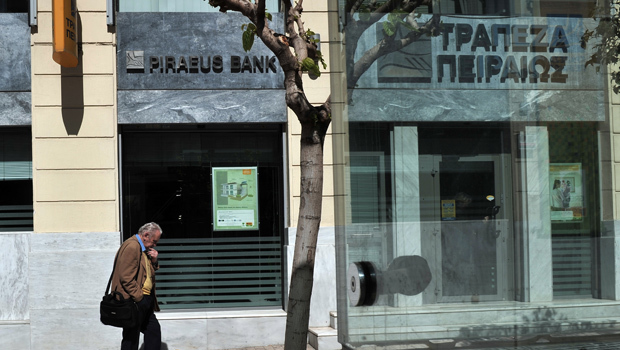 ATHENS, Greece Greece's Piraeus Bank reached an agreement Tuesday to buy the Greek operations of three Cypriot banks for $673 million, as stock markets in Athens were hit hard by the crisis in Cyprus. Piraeus, which was selected last Friday to take over the Greek units of the Bank of Cyprus, Laiki and Hellenic, will see its share of loans in the Greek market rise from 19 percent to 27 percent. Its three new additions have combined assets of $21.1 billion and take Piraeus' branches up to 1,600 with 24,000 employees. Greece's conservative-led government pushed aggressively for the deal, as Cyprus remains in crisis over a bailout that will see large depositors on the island hit by a levy. Piraeus Bank said Cypriot bank branches in Greece would re-open Wednesday, a day earlier than in Cyprus. Despite the deal, the Athens Stock Exchange closed down 4.9 percent on Tuesday as traders returned to their desk following a long weekend. Many European markets, particularly those at the forefront of Europe's debt crisis, fell sharply Monday amid worries that big bank deposits may be raided in future financial bailouts. Greek banking stocks recovered from earlier losses but were still down 1.8 percent. Markets have been rattled by reported remarks by Jeroen Dijsselbloem, who heads eurozone finance ministers' meetings, that the Cyprus bailout could serve as a template. He later modified the comments, describing the Cypriot agreement as "special." In Athens, Finance Minister Yannis Stournaras reiterated that assurance: "The agreement reached by the Eurogroup regards Cyprus alone - no other country." Stournaras visited Greece's president, Karolos Papoulias, who was publicly critical of the Cypriot bailout deal, describing it as "unacceptable" and "selective." Greece has been surviving on rescue loans from other eurozone countries and the International Monetary Fund for nearly three years, but spending cuts have battered the economy, pushing unemployment up to almost 27 percent. But German Finance Minister Wolfgang Schaeuble told a Greek newspaper he believes austerity measures in the crisis-hit country are working, despite growing hardship and high unemployment. Schaeuble said that the measures were making up for decades of policy "lapses," and rejected the notion that Germany is dominating the eurozone and dictating its policy. "There have been many misperceptions. What is a 'German Europe?' - I don't understand what that means," he said. "All decisions taken by the eurozone and the European Union to deal with the crisis were taken unanimously."